Can I get a bench between two planters? If you’ve got a special need, a unique space, or a unique space, then you’re bound to fine something you love with these Specialty Wooden Planters. 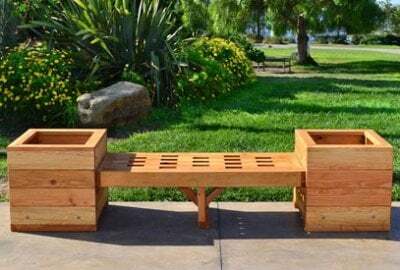 Showcase your plants in style, with multifunctional designs, sturdy redwood builds, and gorgeous craftsmanship, all with the reliability and quality guarantee from Forever Redwood. 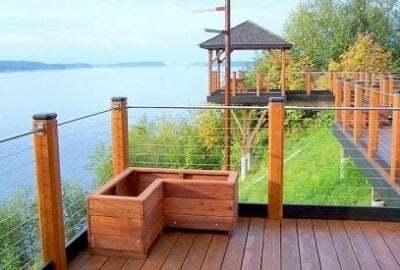 Each type of Specialty Wooden Planter comes with a variety of individual customization options, and can be tailor made to fit your wants/needs. Click the links below for more! Whether it's our thick timbered Bench and Planters Combo, or our Forever Corners Planter, we offer you a new spin on traditional wooden planters. 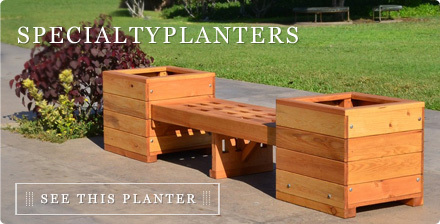 The Bench and Planters Combo matches a sturdy hardwood bench with big square planters on each end to add flowers, shrubs or succulents to. Our Forever Corners Planter wraps around your wall or porch corner to provide a unique way to utilize your planting space. Both are available with a number of custom options, and both are guaranteed to last for a lifetime, rain or shine.